Start and end times remain unchanged, 11.00am until 3.00pm. Further details at wheelers.org.uk/workshop. We will return to our usual location of Limehouse Town Hall from November onwards. A planning permission application has been submitted by LBTH to provide much needed cycle parking at Bethnal Green tube station. The scheme involves demolishing the disused toilet block in Bethnal Green Gardens and providing parking for 78 bicycles. A decision is expected to be made by the planning committee during November 2012. 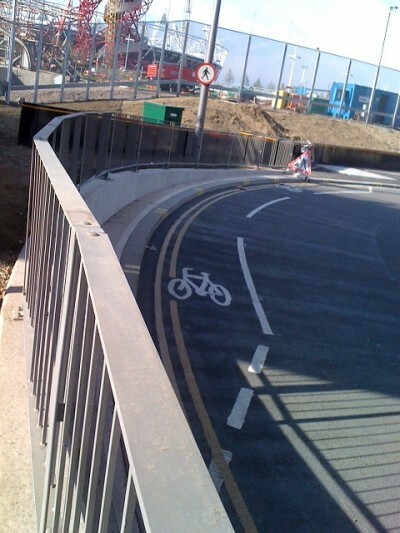 Crap Cycle Lanes: Westfield Honoured! If you've ever cycled to Westfield you will know the design chaos that awaits as you approach the multi million pound shopping mall. No expense spared for cars but bikes get treated to random planning events that switch on and off like psycho disco lights. So you might have thought the Olympics was a chance to build a proper cycling legacy for the DMZ that is Westfield? Not a bit of it. It was a moment of crazy anticipation as I approached one of the most ludicrous cycle lanes in the country, when Westfield reopened its parking in September after the Olympics. Would this nutty cycle lane still be there?....oh yes! It's all of 5 bike lengths long. It's nestled under a bridge, by a fence, on a roundabout. It starts on the roundabout. And stops. On the roundabout. A few yards later. Thank you planners. We are grateful. This local treat has now been honoured by the internationally renowned Cycle Facility of the Month website. We are privileged to be listed in the Crap Cycle Lanes hall of fame for July 2012! Volunteers from the Wheelers workshop provided a Dr Bike service on Sunday, 16th September as part of the London Bikeathon. Located at King Edward Memorial Park, Shadwell we were on hand to give assistance to those on this big charity ride in aid of Leukaemia & Lymphoma Research. Disclaimer: I have found that staff at various stations and facilities also seem confused about policy, so it may well be worth checking their site and taking a printout of the policy if you are relying on taking your bike on a train, for example. We will try to keep this as up-to-date as possible but please check also with the websites concerned... If you know of any changes please let us know. Greenway Closure: The Greenway is scheduled to reopen in December 2012 once temporary London 2012 facilities have been removed. Claims that "Disruptions to cyclists should be minimum as 95% of closures will be on the far side as opposed to the bus lane." Both First Great Western and Southern, serve Dorking, which is the town closest to Box Hill, the focal point of the race. A special timetable, with 6 trains per hour, will run from Waterloo and Victoria in central London to Dorking, calling at Box Hill & Westhumble station. First Great Western trains from Reading to Redhill, passing through several stops close to where the race will go has a ban on cycle carriage throughout the weekend of the 28/29 July. Southern operates between London and Brighton and also operates trains to the stations closest to Box Hill. Restrictions will apply from 27 July to 12 August and 29 August - 9 September. Cycle Hire / Docking Station Suspensions: A number of Cycle Hire docking stations will be suspended at various times. The nearest docking stations are around 15-20 minutes walk away from the Olympic Park. We attended the annual Arnold Circus Picnic on Sunday, 8th July, this year renamed the "Olympicnic" for obvious reasons. Organised by the Friends of Arnold Circus, it's a fun community event we always look forward to. As well as a Dr Bike service, we provided marshalling for the traditional "100 laps of the Circus" bike ride. Read more in the Friends' Day of Discovery and Delight blog post. Svitlana’s family have expressed their shock that the driver of the vehicle that hit her last November at Bow roundabout will not face criminal prosecution and as members of the local cycling community we share that response. Having sat through her inquest on 2nd May at Poplar Coroner’s Court we feel that there was sufficient evidence to go to a jury on a charge of causing death by careless driving. Mr Shergill's own evidence is that during his journey he was on the phone to his father, making travel plans, and that he failed to see Svitlana cycling along the road as he passed her. All the other vehicles’ witnesses saw her. He then saw what he thought was a pedestrian on the pavement but when they ‘disappear’ does not take measures to check their whereabouts in relation to his vehicle before moving off, still talking on his hand-free phone. The police evidence is that this was Svitlana moving her cycle past the stationary traffic to the lights. She placed her bike in the space of about 8 feet between the front of his lorry and the kerb. Neither Mr Shergill nor other witnesses could say that he was indicating the left turn and it could be that she assumed from his position that he was continuing his journey westward. Tragically this led to the collision that killed her and coroner’s narrative verdict of a traumatic road death. We are sad that Mr Shergill did not apologise at the inquest to her mother and sister for her death. We hope that he spends the £150 on fitting the ‘blind-spot’ safety mirror that may have saved her life. Meet at 09.45 on Mile End Road opposite Stepney Green tube station/Co-op shop, ready for a 10.00 departure. Download this flyer showing you a map for the meeting point for the ride back. We should be back at Mile End about 15.00. The District Line is running normally on the day so if you prefer you can take your bike back to the East End by train after the ride. A few days ago, I was made aware via several people, of a Blog Post by Palletline Logistics' chief Bob Russett, calling for Cyclists to be banned from the roads in city centres for their own safety. I did submit a response, (which never appeared) but today the blog post has been mysteriously pulled, without further comment from the firm. 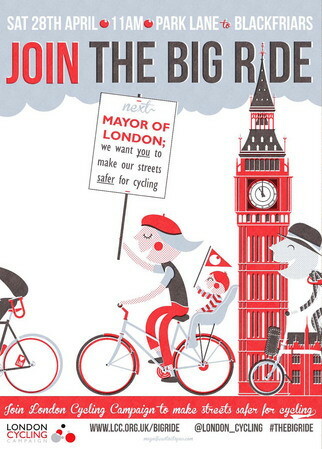 "Bicycles should be banned from the roads in city centres for their own safety ! 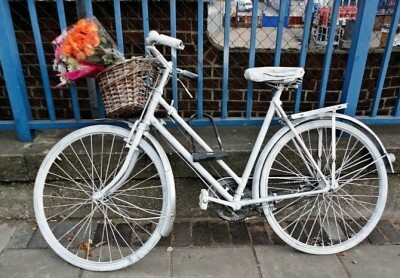 About 18 cyclists die in road traffic accidents in London alone each year and the number is rising. Cyclists appear to think that they are exempt from the rules of the road and they pay for this misapprehension with their lives. We have all seen them weaving in and out of traffic, ignoring red traffic lights , going up one way streets the wrong way and terrorising pedestrians on the pavement. They have little or no appreciation of how much room a truck needs to manoeuvre or the fact that when they are in close proximity there are areas where the driver can not see them in his mirrors. If a car or tuck flouted the law as cyclists do they would be prosecuted and possibly banned from the roads. Why doesn’t this happen to cyclists? If there is an accident invariably the cyclist comes off the worst but the driver can suffer from severe trauma for a long time. This is unfair on someone that is paying a lot of money in fuel and road taxes to use the road while the cyclist pays nothing and has large areas of road space specifically for their use and then refuses to abide by the rules of the road." As you can imagine, the responses (from both Cyclists and LGV drivers!) might not have been what Bob had expected. He is quick to tar all cyclists with the "Jumping red lights/disobaying rules of the road" brush. Not all cyclists behave this way. (In the same way as not all LGV drivers behave the same.) In fact, I am of the opinion that if a cyclist behaves in a way that motorists can reasonably anticpiate their actions, this considerably reduces chances for conflict . Sitting in the cab of a lorry is an eye-opening experience for cyclists when they realise the massive blindspots these vehicles can have and just how little can be seen. "Road Tax" - This old chestnut... Since 1937 there has been no direct relationship between the tax and government expenditure on public roads. Vehicle Excise Duty (VED) is based on vehicle emissions. We all pay for the roads through our council tax. I would like to invite Palletline Logistics to respond in a postive and informed way, and Wheelers and LCC will be only too pleased to help. Perhaps Palletline Logistics would like to be involved in, and sponsor, training and awareness events? Maybe join the discussions on Safer Vehichle and Safer Junction Design? Create a driver training and accreditation scheme? * Indeed, many will recall how Cemex now supports these measures after a mother, Cynthia Barlow, whose daughter Alex was tragically killed, purchased a share in the company, turned up at the firm's AGM, and campaigned for safety measures. An example of how it's possible to turn a tradgedy into something positive. If Cemex and other firms can do this why not Palletline Logistics? why I was deliberately contentious. initiative you speak of is excellent and should be promoted and spread throughout the country. own experience. We all share the roads and must learn how to use them safely together. Why still nothing on the Palletline Logisitics web site stating their commitment to safety, what they are doing to support inititives and 'promote and spread throughout the country' or the training they are giving their drivers...? Bob should practice what he preaches, and maybe blog positive messages about what palletline logisitcs are doing. They should be leading the way and setting an industry example, instead of ranting negatively about cyclists. "Robert Russett is involved in Palletline Logistics (Birmingham) which IS NOT Palletline plc. Though sharing a similar name, Palletline Logistics is a separate legal entity under separate ownership and not a division of Palletline plc." For the avoidance of doubt, I have changed all instances of "Palletline" to read "Palletline Logistics", and removed the reference to Palletline London / FORS. Junction Review, Go Dutch, March exchanging places, Permeability, Hire scheme extends, Towpath consultation, Tower Hamlets Women's Cycling - read now.